PrestaShop, famous of being the owner of the “cutest logo” is one of the most effective and robust platforms in modern eCommerce industry. PrestaShop attracts merchants enabling them to create completely-customizable, feature-packed store in few minutes with no license fees. There is no doubt that PrestaShop is a desirable target platform for many merchants, but what if you don’t want to start from scratch? 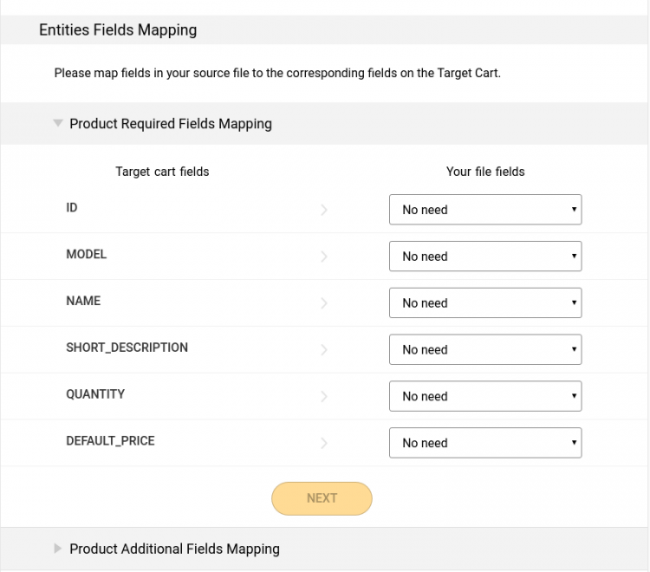 There are couple of ways to fulfill your new store with existing data or even make a switch from another shopping cart. Now stay focused, cause we are going to give you handy options and guidance how to import products to PrestaShop in details. The most irritating and time-consuming way to import products to PrestaShop is manual data input. Even after many web-tutorials, you can mess up placement of important data or lose it. One of possible methods to import products to OpenCart is via CSV files. CSV is a comma separated values that save texts in structured format (numbers and letter only). CSV is frequently used to exchange huge amounts of data between different software. Almost all modern platforms support this format, so you can export your products to it and then import CSV to PrestaShop. Now, the question is how to do it properly without facing thousands of errors? If you decide to do it manually you have to keep in mind that different shopping carts give out and receive CSVs in particular format. It’s one of main reasons why users end up with multiple errors. CSV has the size limit - up to 15MB and not more. That’s why manual import of CSV to PrestaShop could be tedious challenge. Unfortunately, there is no guarantee of successful data transmission. If you’re in search of the method to faster CSV import to PrestaShop you can try some applications and scripts. There are more than 40 of them available on the official PrestaShop addon marketplace. 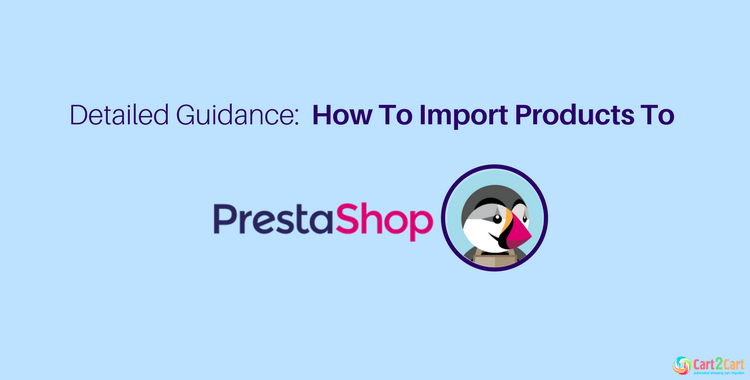 These apps simplify the process of CSV import to PrestaShop, but keep in mind that you need to have some technical skills to use them. If you want to apply this sort of plugins, be careful, some of them can be of dubious quality and injure your files. In case you’re not tech-savvy enough - ask developer’s help ( but that will cost you a lot, no doubts). No worries! There is a solution. You must be asking if there is any reliable way avoid mashing up with codes and multiple errors? There is one secure method to import products to PrestaShop that guarantees your files to be safe and relations between entities not broken. Now let’s go deeper into details of this option. The fastest and absolutely secure option to perform accurate CSV import to PrestaShop and avoid messing up with codes is Cart2Cart automated migration tool. This service is a perfect choice for non-tech merchants as it doesn’t require any user interaction. Cart2Cart is created to exchange data between various supported platforms. 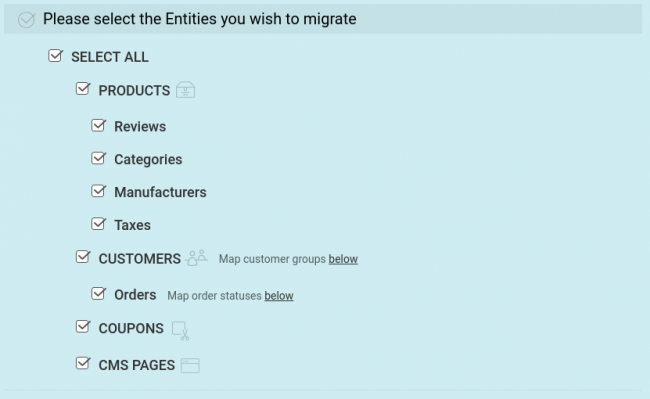 This service allows you to migrate the wide list of eCommerce entities (including products as well, but you can move much more) from one solution to another. Cart2Cart also enables you to automatically import products to PrestaShop in few clicks only. All you need to start data transmission is to give required credentials, choose entities and click “Start Migration” button. You are offered to check the quality of data transfer and perform Free Demo products import to PrestaShop. Test migration will move a limited number of entities to your live PrestaShop store within 30 minutes. Once you are satisfied with the results you can proceed to full-scale products import. Now, we are going to explain you how to use Cart2Cart according to your needs and import CSV to PrestaShop effortlessly. Take a deep breath or make a cup of coffee - we’re starting! 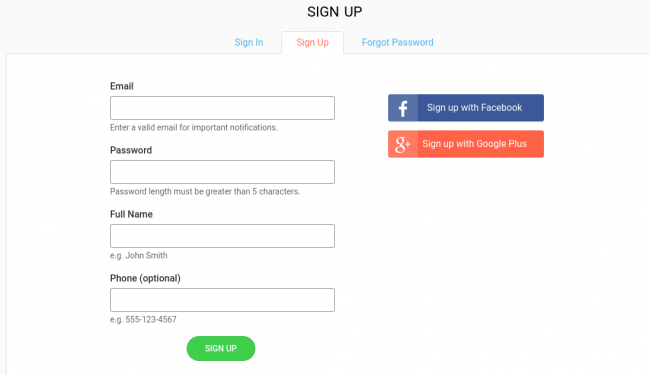 Create new Cart2Cart account or use your existing Facebook or Google account. Choose CSV File as your Source Cart. Optionally, you can provide store URL from where CSV was exported - it will allow you to import product images, which can’t be stored within a CSV file. Otherwise, write down any URL, e.g. https://google.com and proceed. If you want to migrate your store to PrestaShop from another platform, just find yours in the drop-down list. We are sure you’ll find your shopping cart among 80 supported by Cart2Cart. 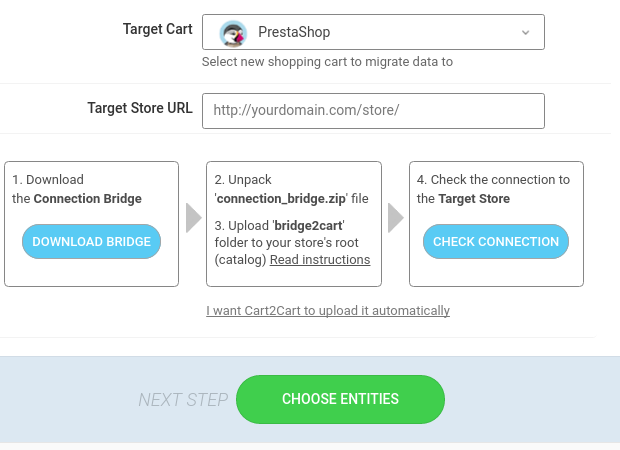 Choose PrestaShop as Target Cart, provide your store URL. Then, download the Connection Bridge, unzip and upload it to your PrestaShop root directory via FTP. After that Click “Choose entities” button to continue. 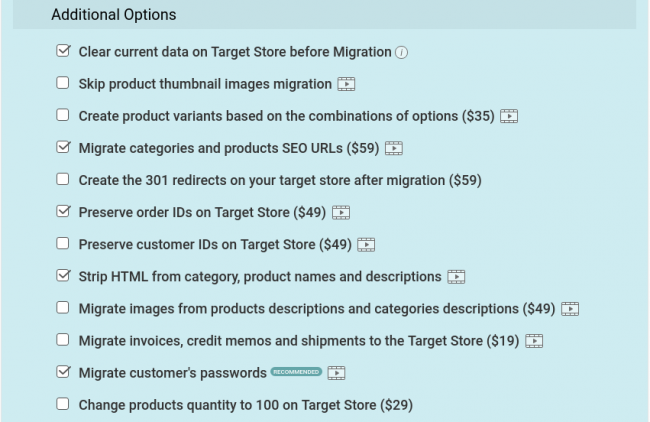 Choose what data you want to import to PrestaShop and put check marks. Right under the entities you’ll find many additional options. They can broaden your possibilities of data import to PrestaShop. Additional options allow you to migrate additional data or do some customizations. E.g. you can Migrate categories and products SEO URLs, it will save existing links to your products and Google ranking. If you import CSV to PrestaShop, you have to upload the file with products and the file with product attributes. The latter is optional, it’s not a problem if you don’t have it. Match the fields of your CSV file with the appropriate one in PrestaShop. Demo products import to PrestaShop allows you to check if everything has been set properly by migrating a limited number of entities to your live PrestaShop store. If you have noticed that you need to change something - no worries, you can restart free demo countless times. Test data transfer lasts up to 30 minutes and after it’s finished, you’ll get an email. After evaluating demo results - launch full-scale CSV import to PrestaShop. Data transmission will start immediately after you click “Start Migration” button. There is no need to sit and wait, because data migration with Cart2Cart doesn’t require user interaction. Once the migration process is over you’ll get the notification email and will be able to check the results. Note: do not make any changes to your Target store during products import to PrestaShop - it’s vital to get successful result. That’s all! Have an enjoyable experience with Cart2Cart. That’s it. Within one-two hours, you’ll get a notification via email after it’s been finished. If some of product images are missing - Check Smart mapping again whether image fields are valid and their URLs are filled in. Ensure that your CSV files permissions are “777". If SKUs are not defined or some paths are invalid it may be caused by wrong characters of CSVs. Look up again at the description section. If you have some product duplicates it may be caused in case the SKUs are mismatched. Check if all SKU frields are matched right. Congrats! Now you’re absolutely ready to import products to PrestaShop. For you that’s no longer a challenge anymore, so try out Free Demo and check how your PrestaShop store is going to look like right away!